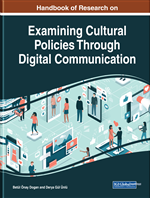 The main aim of this chapter is to describe the current status of participation and commitment of stakeholders in museums and cultural institutions through social networks. The study and analysis were developed following a quantitative methodology to calculate an index of online engagement through direct observation of data from the social network Facebook. Results show low levels of engagement, being most of interactions carried out through “like” and “share” actions, with few comments. It has been also detected that science museums lead in popularity, thematic museums are more prone to comments, and virality stands out in monuments. Likewise, the publication of posts containing audio-visual content are more frequent, and its publication is usually carried out during the week and in the morning. The irruption of Web 2.0 has led to the general development of social media, and of social networks, in particular. Their levels of popularity have made them present in any area of life at a social, political, business and cultural level. The communication strategy in social networks is based on the fundamental principle of content generation, especially if the generation is carried out by the user (Consumer Generated Media, CGM) (Viñaras & Cabezuelo, 2012). In this context, users become active agents in the communication process, with “engagement” as a concept of increasing importance. According to the dialogical theory, the achievement of a true commitment by organizations on the part of their stakeholders has different benefits, mainly the establishment of open and two-way relationships with stakeholders that helps to effectively improve the organization performance (Kent & Taylor, 2002). A growing interest aroused in researchers about social networks has caused the previous literature to be expanded with research aimed at studying online engagement in different areas (Sobaci, 2016). Thus, works have been developed in the field of public government (Bonsón, Royo & Ratkai, 2014), politics (Vergeer, 2015) or in economic sectors such as tourism (Gálvez-Rodríguez, Saraite, Alonso-Cañadas & Caba-Pérez, 2017). Regarding the cultural sphere, and specifically the museum field, the emergence of the Internet and Web 2.0 technologies have improved the access to information about museums and collections they offer (Tasich, 2014). Traditional image-based and text-based formats have given way to digital formats which, together with the fast expansion of new information technologies, have provided the opportunity for these cultural institutions to expand their audiences (Badell, 2015). The constant increase in the use of social media by citizens has forced museums to change their way of communicating, from an official website to foster their presence in different social platforms like Facebook, YouTube or Twitter (Rio Castro, 2011; Badell, 2015). Thus, museums have integrated the potential offered by social media in their communication strategy (Martínez- Sanz, 2012; Claes & Detlell, 2014; López, Margapoti, Maragliano & Bove, 2010), to gain access to a greater audience at a lower cost, and to improve engagement with their stakeholders (Solis, 2007; Fletcher & Lee, 2012). In the cultural sphere, one of the goals of social media is to promote art by increasing audience participation (Suzic, Karlíček & Stříteský, 2016). In this sense, social media provide added value to museums, going from being a physical space to a virtual one, in which the participatory communication capacity is multiplied, hence achieving wider spaces and more open museums (Diaz & Capriotii, 2015). This is the origin of what is known as “museum 2.0” (Srinivasan, Boast, Furner & Becvar, 2009), that is, a museum whose objective is to bring the visitors experience beyond the physical space, to form a space for creation, discussion and negotiation between centres, curators, artists and visitors (Simon, 2010). Cultural Entities: Organization whose existence depends on there being a culture. Online Commitment: The interaction of messages generated within a social network like Facebook. Online Engagement: Participation and commitment reached through social networks. Information and Communication Technologies (ICT): Networking components, applications, and systems that combined allow stakeholders and organizations to interact in the digital world. Museum 2.0.: Evolution of the traditional museum supported by information and communication technologies. Online Virality: The spread of information given through a social network, which occurs when the online community that receives that information decides to share the message with other users. Online Popularity: The acceptance and support of a decision or action taken by an organization and that is communicated via social network.